Spotlight Saturday is a weekly feature, created by Josie at Josie’s Book Corner [aka, moi], dedicated to spotlighting and pinpointing some of the things over the week that have caught my attention more than usual, things I’ve particularly loved, etc. Hello bookworms! Sadly, I missed out on Spotlight Saturday last week, due to a busy time in real life, but hoorah! I am back today to bring a ton of love and recognition to the blogosphere. There’s been lots of action of the blogosphere lately, and I’m excited to share some of these happenings. Since I missed Spotlight Saturday post last week, I thought I might as well feature two blogger spotlights this week (but top be completely honest, I couldn’t pick between these two lovely bloggers to spotlight this week)! The first lovely blogger I’d like to spotlight is Joey @ Thoughts and Afterthoughts, mainly due to his flurry of comments (I am quoting his directly!) all over my blog recently. Due to this, he has been on my mind and I am happy to see his thoughtful comments on my blog. If you ever get to know him (and I suggest you should), I can promise you, he does put effort into commenting, even if they are short bursts. And his witty voice on his blog is just the absolute best. The second blogger I’d like to spotlight is Tanaz @ Bookish Freaks. Tanaz is wonderful to interact with, whether we are talking and fangirling over books, or just simply talking about general things on Twitter. She is a wonderful blogger and she’s so kind. She’s got a genuine heart, and she is always so willing to have a chat with me, and I am grateful for that. Definitely check out this lovely lady! This title needs an ‘s’ on the end of ‘post” because I am about to, once again, throw a ton of awesome blog posts your way! Cait @ Paper Fury shares some of the best bookish moments of all time – and trust me, you’ll be shrieking in agreement with her! Bella @ Chic and Petite shares a mouthwatering recipe for shortbread chocolate chip cookies! Giselle @ A Book and a Cup Of Coffee gets straight to the heart of mental health portrayal and awareness in YA. Alex @ Fiery Reads gives a bunch of blogging tips for new bloggers – and trust me, this will really benefit you if you’re a newbie! Carlisa @ Confessions of Carlisa did the OTP book tag – who doesn’t love a good OTP or two? Georgie @ What Georgie Did shared her trip to Prague, complete with some amazing photographs of the city that makes me REALLY want to travel there – seriously, READ THIS POST NOW. Jenna @ Happy Indulgence reviewed “Symptoms of Being Human” by Jeff Garvin, saying it was a “great book about gender fluidity and had lots of well-researched and detailed information about the subject”. Ah, so many great things happened this week, but the one thing that has been a spotlight this week has been starting my new job. I feel so blessed and lucky to have a job, so soon after I lost my last one (because the store I worked at previously closed down, boo!). Now I am working at my high school that I just graduated from last year, as an assistant! It’s fantastic. On the note of work, yesterday I was unpacking laptops, which involved slicing open boxed with a knife, and I ended up accidentally slicing my thumb in the process! That was definitely a spotlight, and a total shock – for a few seconds I was so stunned that I stood there watching the blood flow, because dashing to the sink to rinse it all out. Once again, I am totally hopeless with my app exploration. Boo, to me. Ah, music. I love music, I adore it. This week I’ve been obsessed with Me & The Rhythm by Selena Gomez. It’s got such a dance-trance type of groove and it just makes me want to dance – and if you know me, you know I am a horrible dancer. Quotes such as these really encourage me, they truly do. I tend to be very conscious of the way I act and the way I treat people. I can’t help but be kind to anyone I meet, because the thought of making someone feel good makes me feel so elated and happy, it’s such a win-win situation when you are kind to another. That is all for this week’s Spotlight Saturday! I hope you all enjoyed! What were YOUR spotlights this week? This entry was posted in Book Blog, Memes & Tags, Spotlight Saturday and tagged blog, blogger spotlight, books, music, quote, Spotlight Saturday. Bookmark the permalink. Another great spotlight post Josie! Oh man, that finger slicing sounds so painful – I hope it heals soon! I absolutely LOVED Simon Vs so I hope you enjoyed it too. Congrats on the new job regardless! Thanks Jeann! Oh yes, my finger is finally starting to heal now. I’ll be reading it soon, I can’t wait! That’s awesome about your new job! 🙂 I can’t wait for you to read Simon vs.. I finished it in just a couple days, because it was such a quick read and I didn’t want to ever put it down! Thank you! I’m very excited to start it as soon as I can! Oh yay, glad to hear that you like this song too! Indeed! OH good luck to you! It’s quite hard to look for jobs, I hope you find something soon! You are too kind to me, Jose. But see here: now you’re just setting me up to fail with my commenting. IT IS QUITE SPORADIC AND RANDOM LOL. Haha! Oh Joey. I love your sporadic and random commenting! Thank you! 😀 And same to you, I hope you love it. I especially love her songs lately! They’ve got a great groove to it. Oh man, maybe we are in sync! No, mine if my left hand. That would’ve been so weird though! I hope you love Simon Vs. as much as I did! I definitely want to read it as soon as I finish my current read! I can’t wait to put up my thoughts about it. Oh, thank you! My thumb is slowly, VERY slowly healing. I really want to! 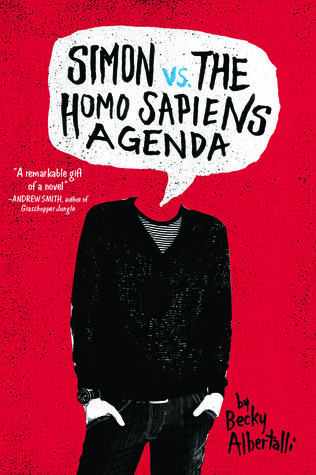 Hopefully I finish the book I’m reading soon, so I can start Simon Vs. I can’t wait to read Simon Vs, it sounds so good, I swear, all I’ve heard from people who’ve read it is that it’s wonderful and so cute! IM EXCITED.